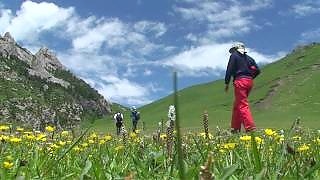 Explore the beautiful ancient town and surrounding sand-dunes and Buddhist caves with Sticker Travel. 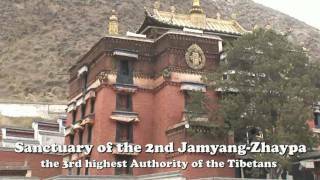 The second film shows the Silk Road DunHuang Hotel. DunHuang lies at the eastern end of the old northern Silk Route, from the ancient capital of Xi'An westwards to Kashgar in XinJiang province. The Great Wall was extended westwards to here around 120 BCE during the Han dynasty (202 BCE - 220 AD). During the Han and Tang dynasties, in particular, it was an important point of communication between China and central Asia. 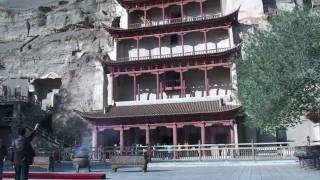 The MaiJiShan Grottoes are filled with thousands of Buddhist sculptures. 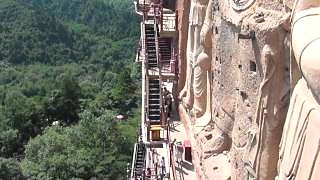 These were carved from the Wei dynasty to the Song dynasty by Buddhist monks who first came here via the North Silk Road. 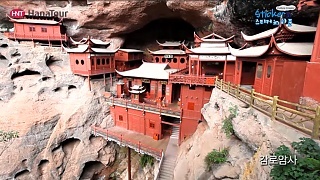 The grottoes are close to TianShui, which is the second largest city in GanSu province in central China, with a population of approximately 3.5 milion. The city lies along the route of the ancient Northern Silk Road by the Wei River, through which much of the trade flowed between China and the West. The Qin state, the founding dynasty of China, arose in this part of China. 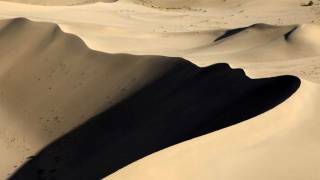 DunHuang lies within an oasis in the Gobi Desert, GanSu province. It was an important stop along the Silk Road. 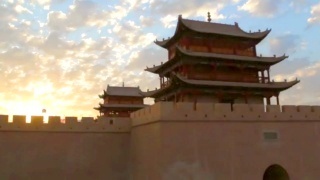 JiaYuGuan is the first pass at the western end of the Great Wall of China. It lies 6 kilometers southwest of the city of JiaYuGuan in GanSu province. The fortress lies between two hills and near to an oasis that was then on the western edge of China. According to legend, when JiaYuGuan was being planned, the official in charge asked the designer to estimate the number of bricks required; the designer surprised the official by giving him an exact number. The official questioned his judgment, asking him if he was sure that would be enough, so the designer added one brick to the total. When JiaYuGuan was finished, there was one brick left over, which was placed loose on one of the gates, where it remains today. 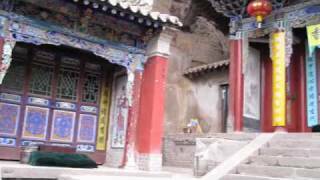 Nearby are the DunHuang Caves (also known as the MoGau Caves); these grottoes date from the 4th century AD and contain Buddhist art from over the next thousand years.